dwedit hat eine neue Version seines NES Emulators für den GBA released. Mit PocketNES und einer Slot 2 kompatiblen Flashkarte könnt ihr eure Retro Gamesauf eurem GBA und Nintendo DS spielen. 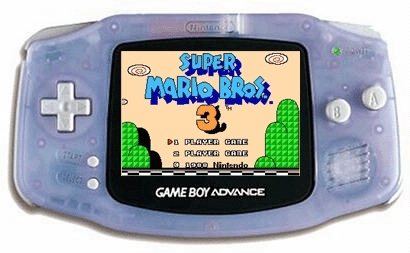 Goomba is ein Gameboy/Gameboy Color Emu für den GBA. - Fixed a bug in the sound init. - Fixed the RTC a bit. - Changed some small things in the cpu core (DK and Kirby faster). Added rumble support on Gameboy Player. Fixed clock on EZ3 cards, maybe others as well. Added option to automaticly load savestates. Fixed some missing text with the new menus. Added setting for autosleep time. Added menu for VSync on/off/slowmo. Changed some of the old palettes and added some more. Added support for 32kbyte ERAM for MBC1 & MBC5 also. Fixed transfer of games that are 128kbyte big. Fixed a smal error with the joypad reg. Added support for clock in games which use it. Added support for 32kbyte external RAM,!!BEWARE!! it's not saved. Fixed joypad reads, no games should use the SGB functions. Fixed sprite size (Chase HQ). Resets more hardware regs before exiting. Workaround for the XG2 bootmenu. Fixed savestates in more games. Fixed reseting of LCDCY reg when changing games. Fixed savestates in "Kirby's Dream Land" & "Pokemon Blue". Fixed MBC1 for big games (1MByte+). Fixed window Y position in some games. Fixed reading of Serial control Reg. Fixed games that uses Push to write to tilemap. Fixed most WIN/BG overlay problems. Changed how IRQ is handled when writing to IRQ enable. GB-Z80 done, probably some bug left. Memory done, only 8kbytes of external ram. LCD done, windows not fully working. Sound done, waveram not allways updated correctly. MBC's, most done, no clock or ram paging yet. Serial done, should act like real. Savestates done, not found any problems. Link Transfer done, as usual works when it wants to. Was ist den eine Slot 2 kompatible Flashkarte....bzw. wo bekommt man die? Ich habe mir den PocketNES auf meine Karte kopiert und wollte mal ein NES-Spiel testen. Wenn ich aber den Emulator starte, bleibt das Display schwarz und wenn ich L+R drücke, sehe ich ganz kurz Einstellungsmöglichkeiten, dann wieder schwarz. Wie bekomme ich den Emulator zum Laufen? Ich nutze einen GBA Micro mit eine EZ Flash IV-Karte mit aktuellem Update. Scheint neuer zu sein als der aus dem Anfangspost. Ansonsten hab ich leider au keine Ahnung warum der nicht geht.